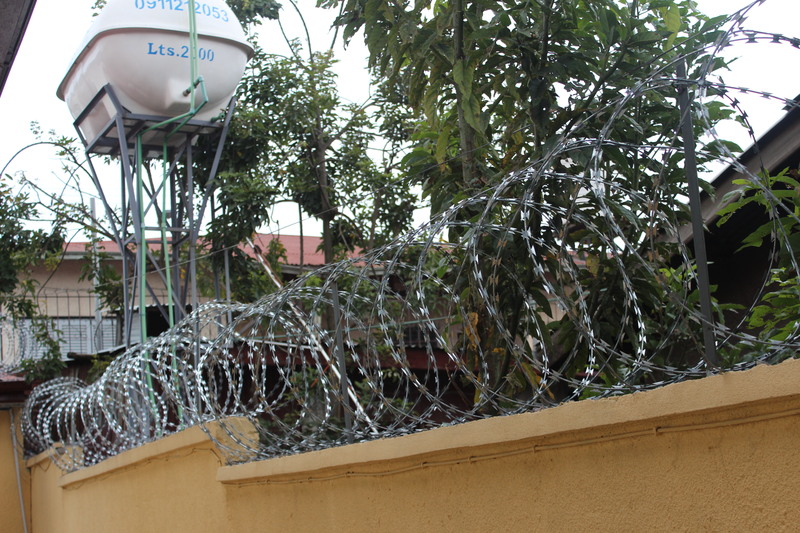 When we moved in to our new place, I couldn’t help but notice we were the only house on the street with no razor wire on the outer walls. I liked it that way, but the school didn’t think it was secure enough. I guess that makes sense. Having the only house on the street without a security system is probably inviting trouble. Last month a pile of what looked like bicycle tires wrapped in brown paper appeared next to the driveway. A couple of weeks later, the maintenance guys unwrapped them and started unrolling the wire coiled inside. Now that we’re officially into the Christmas season, maybe I can convince myself it’s just big tinsel. Happy holidays! This entry was posted in Addis Ababa, Home life and tagged security. Bookmark the permalink.